1 Going Up "Easy as Goo Pie"
2 Small Divide "Easier than it Looks"
3 Hang Low "Wake the Sleeping Goos"
4 Impale Sticky "If You Get in Trouble, Just Go Back in Time"
5 Ivy Towers "Brace Yourself"
8 Flying Machine "Some Balls are Lighter than Other Balls"
9 Fisty's Bog "Not Too High, Not Too Low"
10 Tower of Goo "Higher and Higher"
11 Ode to the Bridge Builder "It Looks Harder than it is"
12 Regurgitation Pumping Station "It's a Secret"
Going Up "Easy as Goo Pie"
OCD: Collect 11 or more goos. The pipe is located directly above the starting structure. All you have to do is build a tower to reach the pipe and the remaining goos will be sucked in. In order to get the OCD, you must only use three goos to complete the tower. Just make sure to place each goo as high as you can so that the third goo can be pulled in by the suction of the pipe. To tell if you are placing the goo high enough, the white guideline should be either entirely or almost invisible; place the goo right at the border. Small Divide "Easier than it Looks"
OCD: Collect 16 or more goos. The pipe is located on the opposite side of a ravine with sleeping goos directly underneath it. In order to reach the pipe, you must build a bridge across the chasm. Unfortunately, because your structure isn't completely rigid, the bridge will begin to sag as you build it. You may have to build up a bit if the bridge sags too much. When you reach the other side of the ravine, the sleeping goos will wake up. Use the goos you have remaining to build up to the pipe, making sure that you have at least 8 goos to complete the level. Hang Low "Wake the Sleeping Goos"
OCD: Collect 22 or more goos. The pipe is located above the structure and a bunch of sleeping goos are located at the bottom of the stage. The first step is to build a ladder down to the sleeping goos. Once they have been woken up, build a tower on the top of the structure to reach the pipe. This simple strategy, however, will not allow you to collect the 22 goo balls needed for OCD. For OCD begin by pulling all the goo balls off the existing structure; they are weighing the ladder down, so it takes more goo balls to reach the pipe. Then build a ladder to the pipe with only five goo balls Pulling all the balls off the ladder first makes the structure lighter so that it can activate the pipe suction with fewer goo balls used in construction. Then use the remaining goo balls to aggressively collide with the sleeping goo balls. Grab a goo ball and fling at the sleepers, and let go just before reaching the sleeping goo balls, which flings the sleeping goo balls into the air. Goo balls will wake up when they approach the ladder. You may have to grab some goo balls off the ladder before they reach the pipe so you can continue to collide the sleepers. Be cautious not to let go at a time that will build a ladder. This strategy allows all the goo balls that would have been used in the first strategy to actually be saved and achieve OCD. Impale Sticky "If You Get in Trouble, Just Go Back in Time"
OCD: Collect 42 or more goos. The pipe is located on the top of the stage. You must build a structure that loops around a corner and avoids a spinning cog. Further, if you build too far out to the left, the weight of the structure will cause it to break. To begin, build the structure to the right for some counterweight to support the structure. Then begin to build out to the left making sure to steer clear of the spinning cog. Remember that the goos moving around on the structure will causes it to wobble, so you need plenty of room between the structure and cog. Build around the corner to reach the pipe. 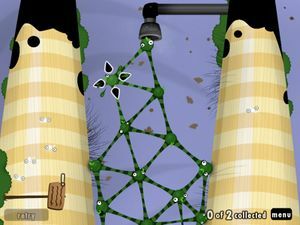 Gradually work your way to the top - reach up as far as you can with the ivy goos, trying to follow the pattern for the tower you are building. When you run out of available goos, tear ones from the far bottom and place them on top. To get OCD, reach the suction without any mobile goos. Once there, sever the top two goos from the rest of the structure, to give a dangling mini-tower. Disassemble the lower tower, sending the goos one-by-one to the suction. Finally, pull the lower goo away to pull the 16th goo into the collection. OCD: Collect 35 or more goos. Since the room keeps turning around, you will have to expand your tower in all directions. As it grows, it will eventually become large for the room and reach the top. To get OCD, build the tower "inefficiently" to reach the suction without any mobile goos. Once there, sever the top two goos from the rest of the structure, to give a dangling mini-tower. Disassemble the lower tower, sending the goos one-by-one to the suction. Finally, pull the lower goo away to pull the 35th goo into the collection. OCD: Collect 25 or more goos. Use the ivy goos to reach the common goos sleeping at the bottom, then use the ivy goos to reach the top. To get OCD, use the ivy goos to weigh down one side of the chain. Then, gradually build the ivy tower to the top, placing a common black goo at the top. Sever the top and bring the goos to the exit one-by-one. The last goo involves breaking the top. Flying Machine "Some Balls are Lighter than Other Balls"
OCD: Complete level in 16 seconds or less. Use the balloons to raise the gates, then attach the balloons to the tower. Fisty's Bog "Not Too High, Not Too Low"
OCD: Complete level in 14 moves or less. Carefully build outward, reinforcing the structure with the balloon goos whenever it begins to sag. However, when you add a balloon goo, quickly build outward with one or two goos to make sure the balloon goo does not pull the structure to the "ceiling" and pop against the spikes; balance the weight. Tower of Goo "Higher and Higher"
OCD: Collect 65 or more goos. Start by building a base about five squares (8 goos total, not counting the original square) and build up about three layers. After that, continue the upwards structure with four squares across, and then three, then two, and then one. Keep an eye on the amount of goos you have, remember that you need at least 25. Ode to the Bridge Builder "It Looks Harder than it is"
OCD: Collect 38 or more goos. This is a simple bridge building to the right. If necessary, you can strengthen the bridge by making it thicker, or by having one of the goos rest against the cliff face. Regurgitation Pumping Station "It's a Secret"
OCD: Complete level in 42 moves or less. You first need to brace your structure against the sides of the stomach, to prevent chaotic motions from knocking the tower down, then build upward. Go up cautiously, as it's easy for the tower to topple to the side. Avoid the gears on the left and right and go straight up through the small gap. When you build far enough into the throat, your tower should be forced up, and some goos may be left behind in the stomach. If it stops, either continue building the tower upward, or tear off one of the goos that is jammed in the tight tunnel. Once you reach the top, attach the eyes to the goo structure. The remaining task is to attach the giant eyes to your structure. These eyes will act as balloons, and will carry your tower into the sky. This page was last edited on 10 January 2016, at 06:32. This page has been accessed 18,601 times.